PRICE: $8.50 which includes US shipping. 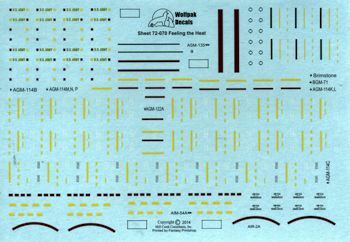 This next Wolfpak Decals sheet continues more missile markings, but with more of a view towards those used by the Army. First up is the AGM-122 Sidearm missile, then we get into the Hellfires with the AGM 114B/C/K/L/M versions. The BGM-71 TOW is next with alternate paint schemes. Next is the Brimstone, a missile I know nothing about, followed by an AIR-2A Genie, an AIM-54A Phoenix and ending with the ASM-135 ASAT. There is an extensive markings placement guide for missiles in several color schemes and information on what goes where. 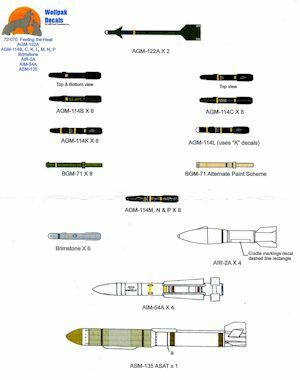 In addition, there is a valuable instruction sheet that helps provide some detail information regarding many of these missiles. For some missiles you can do up to 10 while with others a pair is provided in terms of markings. I should also mention that the instructions provide information for training rounds as well. In all, it makes for a most useful decal sheet for those who want to get their next load-out just right.